3M Company Bought Back $2.1 Billion Worth of Stock in the First Half. Should Investors Be Happy? Why the buyback plans for the maker of Scotch tape and Post-it Notes are not good news for investors. At the time of its second-quarter results, 3M Company (NYSE:MMM) announced that the company had made $2.1 billion worth of share repurchases in the first half of 2016, with a total of $4 billion to $6 billion planned for the full year. In addition, at 3M Company's investor-day presentation in March management announced plans to boost EPS by making stock buybacks in the 2016-2020 period. Frankly, I don't think this is a positive development for the stock, and here's why. 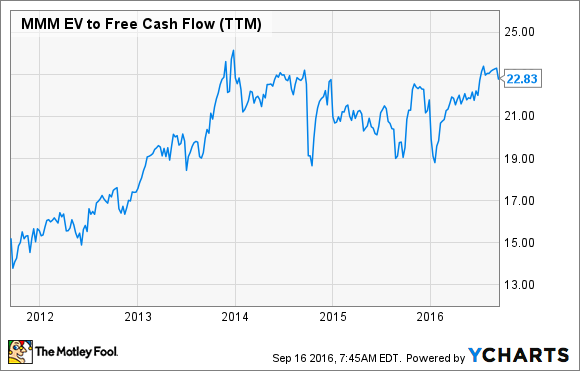 SHOULD 3M COMPANY BE USING ITS CASH FLOW TO BUY BACK STOCK SO AGGRESSIVELY? IMAGE SOURCE: GETTY IMAGES. Going back to the investor-day presentation, management announced the following headline targets for the five-year period 2016-2020. Organic local currency growth of 2% to 5% per annum. Average annual EPS growth of 8% to 11%. Free cash flow conversion from net income of 100%. Alongside the headline guidance, CFO Nick Gangestad outlined the company's capital-allocation strategy, which includes the plan to add 2% to 4% to EPS via stock buybacks. In reality, that's quite a wide range and gives management the opportunity to boost faltering EPS growth simply by making stock buybacks. 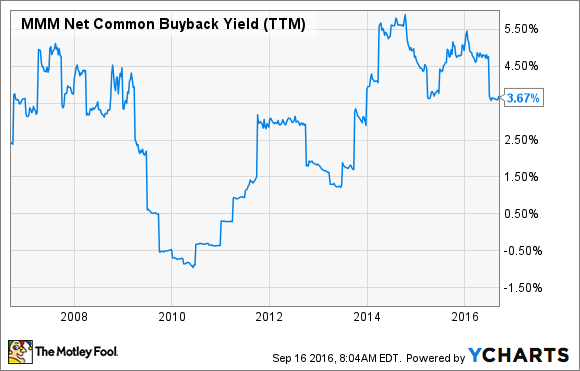 Repurchasing stock is not a bad thing in itself. However, consider a scenario whereby 3M Company is on track to grow EPS by only 4% and then uses its cash flow to buy stock and boost EPS by 4% to hit the bottom range of its annual growth target. This is fine and worthy, but it might not be a good idea if the stock is highly priced. In other words, management could be inefficiently using shareholders' cash (through buybacks) just to hit earnings targets. Indeed, based on the current price, the company should arguably not be buying back stock at all. The following chart shows that its enterprise value (market cap plus net debt)-to-free cash flow ratio currently stands at 22.8. I prefer to flip this ratio and think in terms of seeing the company generating 4.4% of its current enterprise value in free cash flow. So at the current price, 3M is swapping investing in, say, acquisitions or expanding its own operations in favor of buying back stock at a yield of just 4.4%. Ideally, you want a company to buy back stock when its free cash flow-to-enterprise value yield is high (and free cash flow is good), not when its yield is relatively low. Moreover, share repurchases don't come free. In fact, Gangestad's plan to enhance the capital structure involves building up net debt from $8.9 billion at the end of 2015 to a range of $15 billion to $19 billion by 2020. Let's put this into context. Gangestad expects operational cash flow of between $45 billion and $50 billion in the next five years. Moreover, he plans to add leverage (increasing debt to equity) of some $10 billion to $15 billion to reach a deployable capital figure of $55 billion to $65 billion. However, research-and-development costs and capital-expenditure requirements will eat up $16 billion to $19 billion of this figure. Dividends will use up a further $14 billion to $15 billion, and funds allocated to retirement plans will take up $1 billion to $2 billion. Add it all up, and it means $24 billion to $29 billion is left for acquisitions and buybacks, around half of which is being paid for by adding leverage of $10 billion to $15 billion. But what happens if the company suffers an earnings (and therefore operating-cash-flow) shortfall? Would it be a sound strategy to carry on building up debt just to pay for buybacks at a time when cash flow is declining? Second, the five-year plan targets organic local currency growth of 2% to 5%, but management recently downgraded local currency sales growth expectations to just 0% to 1% for 2016. It looks as if 3M Company might need more financial firepower to make acquisitions to hit its growth targets in the future. So ultimately, buying back stock might constrain the company's ability to make acquisitions, especially at a time when more research-and-development expenditures are needed. 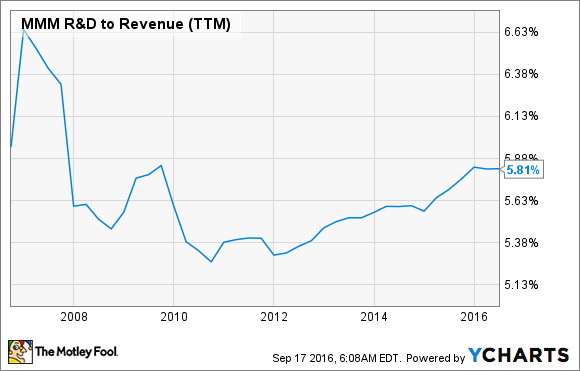 3M Company is not a cheap stock, and its projected organic growth rate in 2016 is lower than its five-year (2016-2020) targets. The company's stock buybacks are arguably constraining the company's ability to buy growth through acquisitions. Moreover, it's adding to the debt load and somewhat flattering 3M's EPS growth rate. It's not something to be happy about.